Made from 1988-1990 This version of the Eliminator started it all, taking its cue fromthe Cherokee sport. 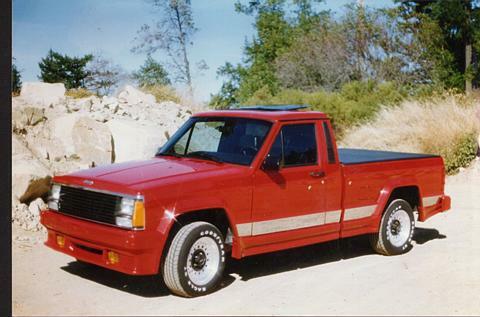 Based on the 2 wheel-drive short-bed, the Eliminator came standard with the Power Tech six, tape graphics, color-keyed grill, fender flares, front air dam, and new 10 hole alloy wheels with 215/64HR14 tire. Inside was a standard tachometer, bucket seats, a sport steering wheel, and upgraded trim. Easily recognizeable from the "Eliminator" Graphic on the upper forward part of the bed. 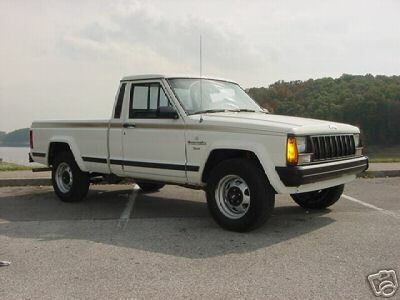 Made only in 1988, the Olympic Comanche was a celebration of Jeep sponsoring the 1988 Olympic Games. It could be ordered with other packages, such as the Pioneer. It was a model with many standard options. Such as a trim group, and a tape graphics package. They are very easily spotted by the fading golden trim stripe on the bed, and the 5 rings in graphic from on top of the "Comanche" emblem, and the 5 rings in the back window behind the driver. Shown on the right is a 1988 Olympic edition Pioneer. You can see the Pioneer emblem below the Comanche and the 5 rings above the Comanche emblem. Made from 1991 to 1992 in with this graphic, they remained basically the same as before, with the exception of the updated graphics. 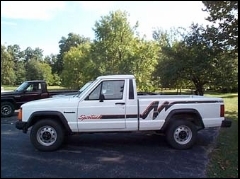 Made from 1991 to 1992, the newer version of the SporTrucK, remained only a step up from the base model, but got a new updated graphics package for 1991. Made from 1991 to 1992 The Eliminator remained the same, but got an updated graphics package, along with 4WD in 1990. The new graphics were now a full body tape strip, starting at the rear of the front fenderwell, and going al of the way to the tail lights. It had 2 colors, and were light and dark grey, with a double "Eliminator" graphic in the tape on the doors. 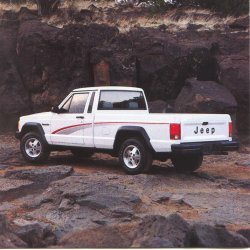 Made only in 1992, The sport option was a late struggle to dress up the Comanche when its head was already across the chopping block. It was a step up from the SporTrucK, and included a sweeping graphic. These were offered on Shortbed models throught out the years. The style varied from year to year, and model to model, but there were only 100 of them made, and they all have the tag on the dash, giving them away. Shown to the right is number 24 of 100.